Seems like most people I know like rocks. They bring home unusual rocks from vacations; they admire beautiful facing stones on buildings; they frequently ask “What is this rock”? Considering that the type of rock you’re looking at reflects the processes that caused it to form, some basic rock identification skills can go a long way to understanding our planet! 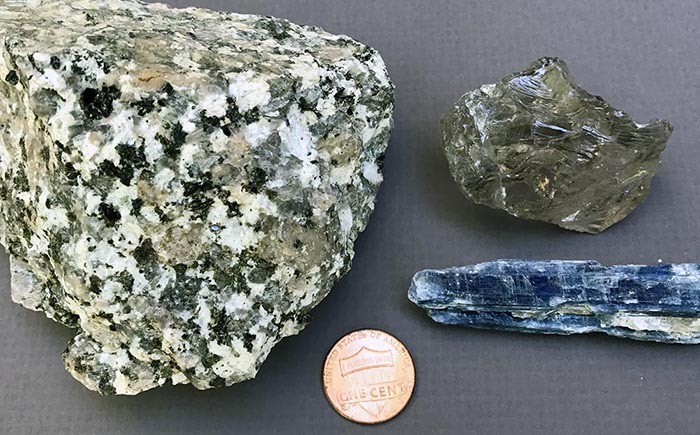 Rock (left, igneous-granite) and minerals (right, quartz and kyanite). Notice that the granite is made of a variety of minerals. Of course there are thousands of different rock types —But! they ALL fit into one of three categories: igneous, sedimentary, or metamorphic. Here’s a brief, illustrated summary of each. Igneous rocks are those that form by cooling and crystallization from a molten state. Consequently, they consist of crystals of various minerals that form an interlocking mosaic like the rock in the photo to the right. Igneous rocks are further classified as “intrusive” or “extrusive”, depending if they form beneath Earth’s surface (intrusive) or on Earth’s surface (extrusive). Extrusive rocks are more commonly called volcanic rocks. Generally speaking, intrusive rocks are coarsely crystalline whereas volcanic ones are finely crystalline. Check out this gallery of igneous rock photos. Sedimentary rocks are made of particles (“sediment”) of pre-existing rock that are deposited as layers on Earth’s surface and then become cemented together. Individual layers of sedimentary rock are called “beds”. Bedding is best observed from a distance; most individual sedimentary rocks come from within a bed and so may appear homogeneous. Check out this gallery of sedimentary rock photos. Metamorphic rocks are pre-existing rocks that change (“metamorphose”) because they are subject to high temperatures and/or pressures. This change involves the growth of new crystals in the rock. Because this growth typically occurs under conditions of high pressure as well as temperature, the new minerals tend to grow in a preferred orientation, leading to a fine-scale layering in the rock. This layering is called foliation. Unlike bedding in sedimentary rock, foliation tends to be irregular and marked by differently colored zones of different minerals. 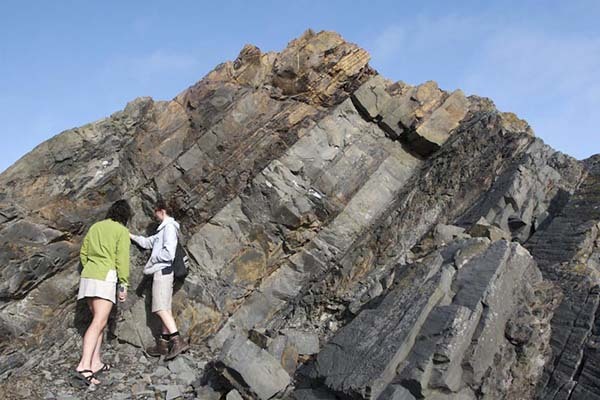 Check out this gallery of metamorphic rock photos. Telling Igneous, Sedimentary, and Metamorphic rocks apart is usually pretty easy. First, decide if the rock consists of crystals or rounded grains. If it consists of crystals, then it is igneous or metamorphic; if it consists of grains, then it is sedimentary. If the crystals are arranged into layers or bands, the rock is metamorphic; if they are randomly arranged, then it is igneous. Igneous rocks with large crystals generally indicate slow cooling within the earth (intrusive). Conversely, igneous rocks with small crystals generally indicate rapid cooling on Earth’s surface (volcanic). 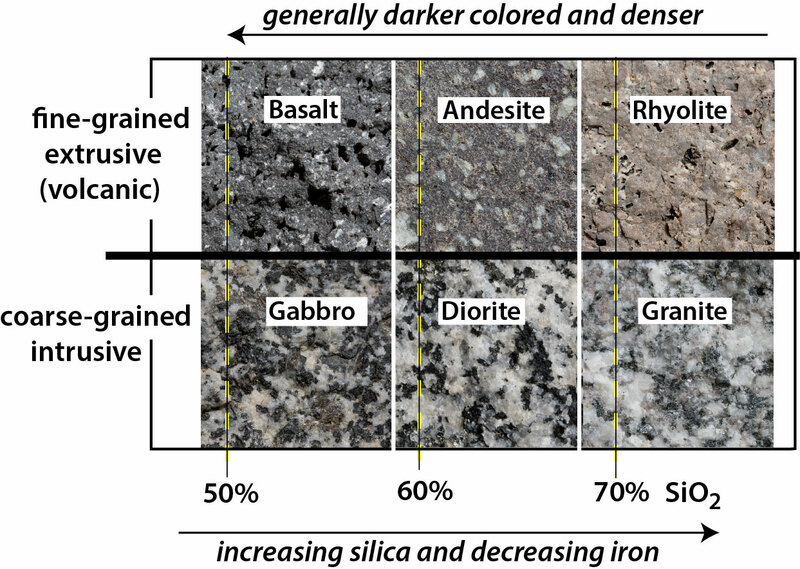 Intrusive and volcanic rocks are further classified based on their chemistry and texture according to the chart below. This is one place where mineral identification becomes very important because minerals reflect the rock’s chemistry. Importantly, rocks with high silica content, such as rhyolite and granite, typically have fairly low iron contents, and so tend to have minerals that are light in color, such as K-feldspar, sodium-rich plagioclase, and quartz. Conversely, rocks with low silica content, such as basalt and gabbro, typically have high iron contents, and so have minerals that tend to be dark in color. Principal igneous rock types. Their classification depends on texture and composition. 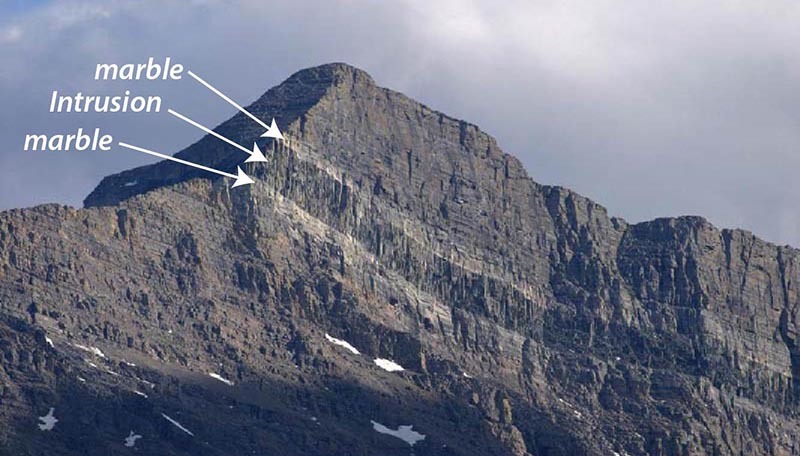 Fine-grained rocks are extrusive (upper row), whereas coarse-grained rocks are intrusive (lower row). Silica content then determines the specific rock name: gabbro and basalt <50-57%, SiO2; diorite and andesite, 57-67%; granite and rhyolite, 67+%. Notice that rocks tend to be darker, denser, and more iron rich towards the lower silica end of the spectrum. Being igneous, volcanic rocks are made of crystals –but they’re so fine grained, you often can’t see that without a microscope. Thankfully, many volcanic rocks contain phenocrysts, larger crystals surrounded by the finer grained matrix. If you look closely at the photos of basalt and andesite above, you can see phenocrysts of plagioclase feldspar as the small white things. Below are more photos, showing a more enlarged view of a rock with phenocrysts. Note how fine grained the surrounding matrix is –you can’t really see anything at all. If you look at the microscopic view though you can see that the whole rock is crystalline, even the super-fine matrix. The point here is that, unless the rock contains glass (see next section), the whole rock is crystalline! One of the more ubiquitous volcanic products, volcanic glass is just that –glass–so it lacks a crystal structure. Glass can form when the lava is so dry as to inhibit crystal growth, as in obsidian, or when lava cools so quickly as to prevent crystal growth, such as with volcanic ash and pumice. The photos below show pumice, which is frothy volcanic glass. It gets that texture because it forms during violent eruptions –explosively expanding gases in the lava shatter the fast-cooling material so that the rock consists of air bubbles (called vesicles) separated by glassy sidewalls. Pumice: frothy volcanic glass from instantaneous cooling. Left-hand image shows close-up view of glass threads. Paper clip for scale. Pyroclastic materials (also called “tephra”) form during explosive eruptions and so consist of rock fragments and glass ejected violently from the volcano. We classify it according to its size: large fragments are called blocks or bombs; small particles, between about 2mm – 64mm, are called “lapilli”; tiny particles, smaller than 2mm, are called “ash“. Pumice is also pyroclastic, but it’s considered its own rock type –and it can be of any size. Pyroclastic falls can result from any explosive eruption in which pyroclastic materials fall out from the atmosphere; pyroclastic flows are those that flow out over the ground surface. Now the rocks. The most common pyroclastic rock is undoubtedly “tuff”, which is composed largely of ash and pumice fragments, erupted mostly during rhyolitic eruptions. Air fall tuff forms from ash that accumulates in layers as it settles from the atmosphere; Ash flow tuff forms from bodies of ash that flow rapidly along the ground, typically incinerating everything in their paths. Because the material flows, it typically does not form layers. Many ash flow tuffs are welded (called “welded tuff”) because of the high temperatures. These highly welded tuffs are sometimes called “ignimbrites”. 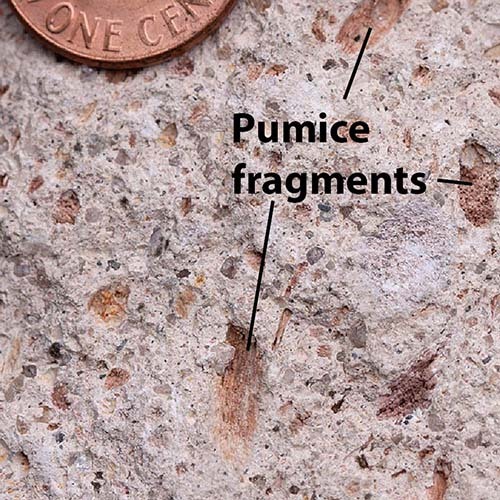 To identify tuff, look for pieces of pumice floating around in the ashy matrix. 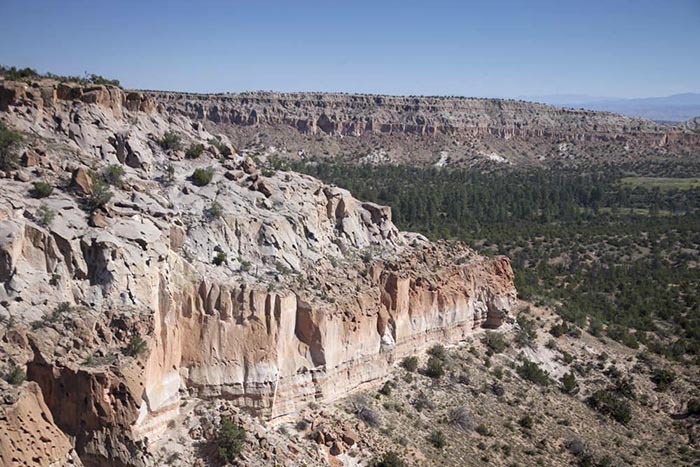 Below’s a view of the Bandelier Tuff in northern New Mexico. It’s a series of ash flow tuffs formed during huge eruptions 1.6 and 1.25 million years ago in the Jemez Mountains. These eruptions formed the Valles-Toledo Caldera (generally just called the “Valles Caldera”). You can get an idea as to the size of the eruptions based on the size of the flows: they’re thick! Cliffs of Bandelier Tuff, erupted from Valles Caldera, New Mexico. New Zealand’s Taupo Volcanic Zone hosts the most frequent recent rhyolitic eruptions than anywhere else in the world, all active in the last 2 million years. The most recent big eruptions, 26,500 and 1800 years ago, were centered on Lake Taupo, near the middle of the North Island. Below is a map showing the distribution of airfall and ignimbrite (welded ash flow) deposits formed during the eruption at AD 186, just over 1800 years ago. The estimated volume of all eruptive products during this eruption exceeds 105 km3 (Wilson, and Walker, 1985). By comparison, the older “Oruanui” eruption, 26,500 years ago? It likely erupted more than 1000 km3! (Wilson, 2001). Taupo vent (red triangle) and distribution of airfall and ashflow deposits from AD186 eruption. Inset shows Taupo Volcanic Zone on New Zealand’s North Island. From Wilson and Walker, 1985. Wilson, C.J.N., and Walker, G.P.L., 1985, The Taupo eruption, New Zealand i. General Aspects, Philosophical Transactions of the Royal Society of London, v. 314, p. 199-228. Wilson, C.J.N., 2001, The 26.5 Oruanui eruption, New Zealand: an introduction and overview, Journal of Volcanology and Geothermal Research, v. 112, p. 133-174). Sedimentary rock may be clastic, biogenic, or chemical, depending on how the particles formed. Clastic sedimentary rocks contain actual pieces of the pre-existing rock that have been transported from the original source. During this transportation, the particle breaks into smaller grains and typically becomes rounded. 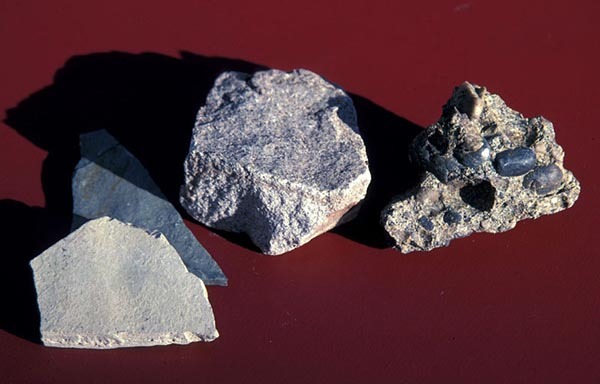 Clastic sedimentary rocks are further classified according to grain size: shale contains clay-sized grains; siltstone contains silt-sized grains; sandstone contains sand-sized grains; conglomerate contains grains that are pebble to boulder-sized. Clastic sedimentary rocks: shale (left), sandstone (center), and conglomerate (right). Biogenic sedimentary rocks are those that form through biological activity. By far the most common example is limestone, which forms by the production of calcium carbonate by algae and invertebrate animals for shells. Other examples include dolomite, which forms by the same process as limestone, and chert, which forms by the accumulation of silica-producing organisms on the sea floor. Chemical sedimentary rocks form by non-biologically induced precipation of minerals. Examples include sinter and travertine, which consist of silica and calcium carbonate respectively, precipitated from hot water at thermal springs. Another important example is bedded salt, which forms today by evaporation in closed desert basins. Tilted sedimentary rocks –started out horizontally. You can’t see the bedding in the rock samples shown above, but if you were to stand back from an outcrop of sedimentary rocks, you probably could see the bedding. That’s because most individual samples don’t go across bedding but instead come from individual beds. Most metamorphic rocks are classified according to their grain size and the resulting nature of their foliation. Slates are the finest grained metamorphic rock, followed by phyllite, schist, and gneiss, being the coarsest grained. Gneiss is especially distinctive because most of its crystals are readily visible and its foliation is marked by bands of different minerals. In general, crystal size corresponds to the metamorphic grade, or intensity, with the most coarsely crystalline rocks being of the highest grades. Metamorphic rocks. From left to right: slate, phyllite, schist, gneiss. Note that each rock has layering (foliation) that is caused by a parallel arrangement of platy minerals within the rock. And then there are metamorphic rocks that form just because of high temperatures, typically because they were heated by the intrusion of a nearby igneous body. This type of metamorphism, called “contact metamorphism” is a common origin for non-foliated marbles and quartzites. Marble forms by contact metamorphism of limestone and dolomite; quartzite forms by contact metamorphism of sandstone. The photo on the below shows the igneous rock diorite intruding the sedimentary Helena Dolomite in Glacier National Park, Montana. You can see how contact metamorphism has turned the dolomite next to the intrusion into a white marble. Ooooh! Intrusive “sill” of diorite and the resulting contact metamorphism of adjacent gray dolomite to white marble in Glacier National Park, MT. For more, higher resolution photos of each feature or rock type, try doing a geology keyword search for any of the rock types or features described here. Some useful keywords are “igneous, intrusive, volcanic, metamorphic, sedimentary, phenocryst, tuff, pumice, or volcanic glass” –or any others you can think of. Enjoy!